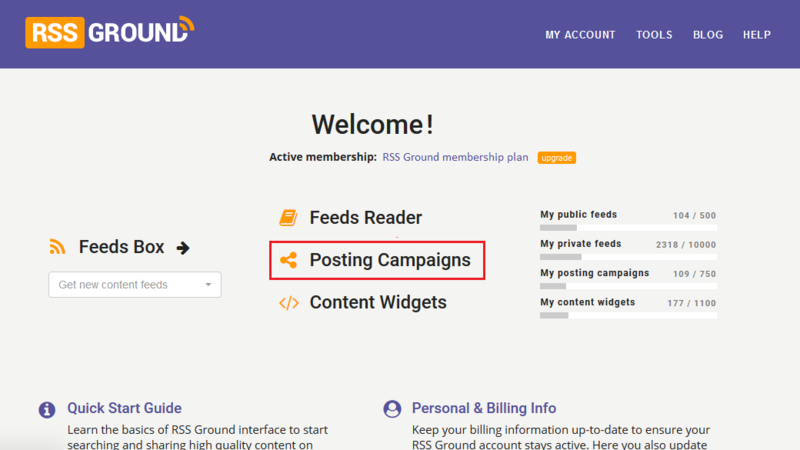 This tutorial is about managing your posting campaigns under RSS Ground account. 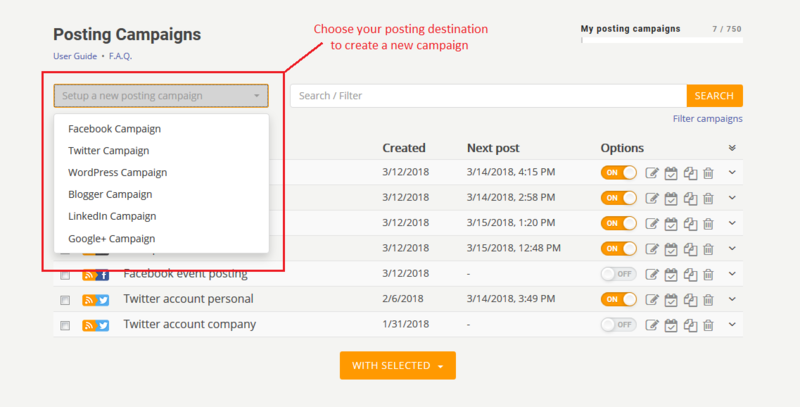 If you don't have any posting campaigns yet and have no idea how to create one, it will be better to start with Creating Posting Campaign tutorial and then come back here to continue. 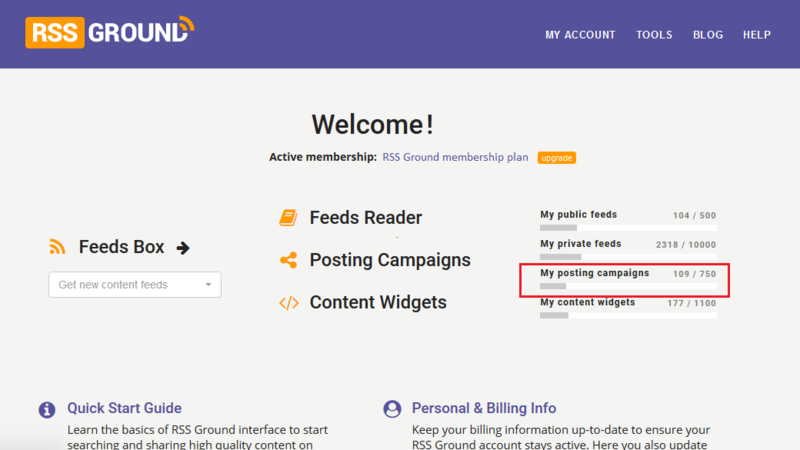 You can have one or several active posting campaigns under your RSS Ground account depending on your membership level. 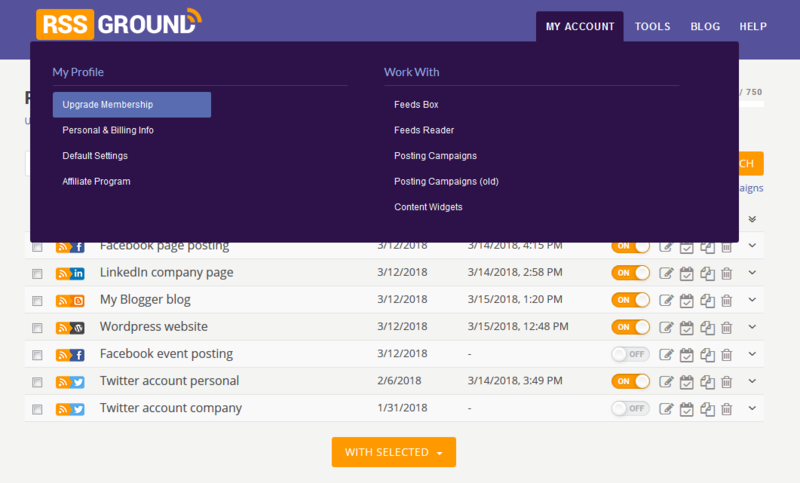 See how many campaigns you already have and how close you are to your limit in MY ACCOUNT section of your RSS Ground account. 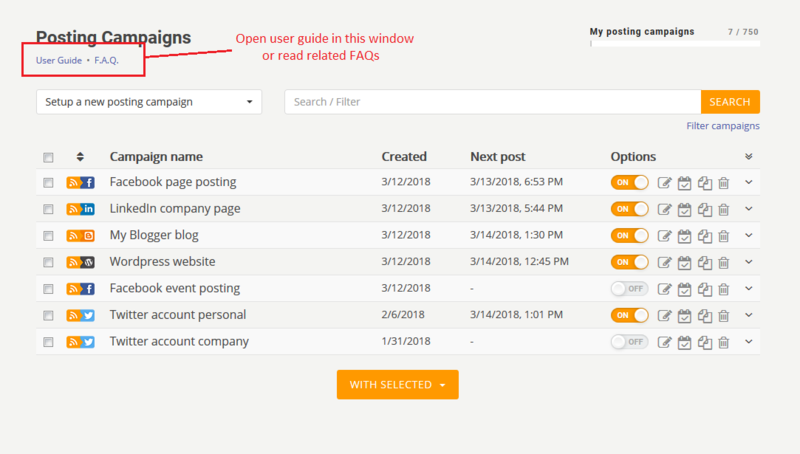 To find all created posting campaigns and manage them, please click on Posting Campaigns in MY ACCOUNT section. Posing campaigns are sorted by creation time with the most recent campaigns on the top. You can search for a particular posting campaign by keywords using Search bar. Or you can use Filter campaigns option to filter a group of campaigns with the same parameter. To activate or deactivate (put on pause) a posting campaign manually use ON/OFF toggle. When you create a new posting campaign or edit and save an existing campaign they are activated automatically. 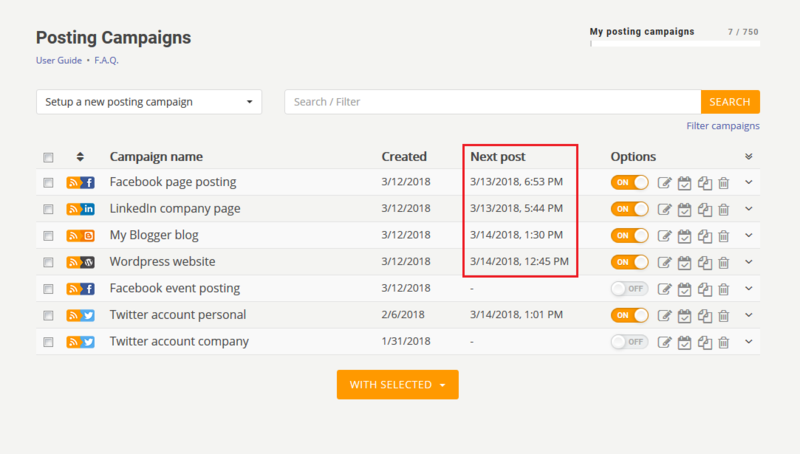 If your posting campaign is activated you can always see when it will make its next post. 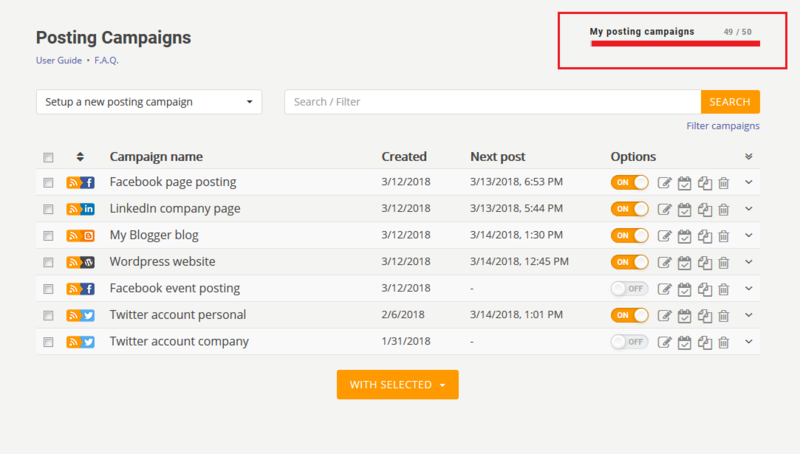 To make changes to posting campaign automation or any other changes click on Edit icon to go to campaign editor. By the way, you can easily create a copy of your posting campaign if you wish to create a new one with similar settings. Click on Copy icon. Each campaign has its log where all recent campaign's activities are shown. Click on Log icon to preview it. 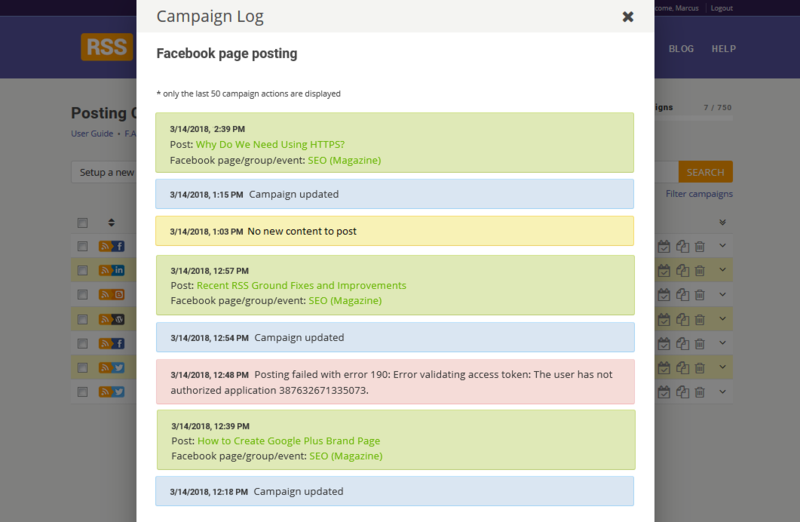 In the campaign's log, you can see a history of latest posts and campaign updates. For better visual interpretation log records are color coded. All user manual activities, like campaign activation, deactivation or update, are colored in blue. Successful posts have a green color and contain a link to the published post. If you see a yellow message saying 'No new content to post' this means that there is no relevant content in your content feeds at the moment and posting campaign will check them again on the next run. And if you see a red message, this means that there is a serious problem with your posting campaign. 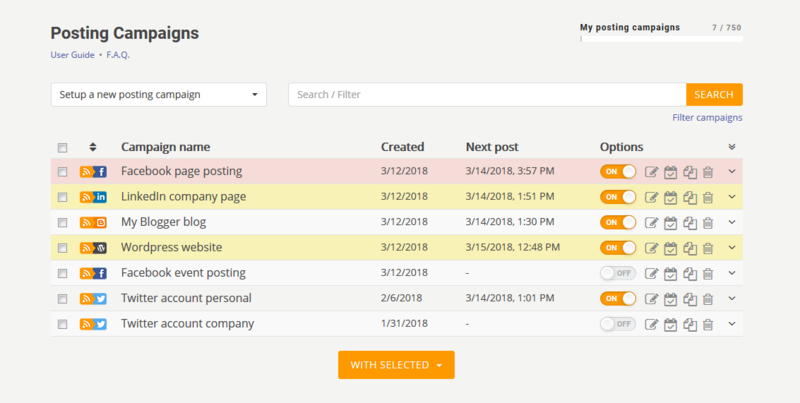 Most likely, there is a problem connecting to your blog or social media. You need to urgently go to campaign editor and re-authenticate your blog or social media account. If the red message says about any other error or re-authentication doesn't help, please contact our support team for further instructions. For your convenience, we highlight campaigns which had a problem with a recent post. If no new content was found for posting campaign name is highlighted in yellow. Campaign with a more serious problem is highlighted in red. To see the last log record or find out why this campaign is highlighted, simply click on "arrow down" to expand posting campaign description. If you think you don't need this campaign any more click on Delete icon. 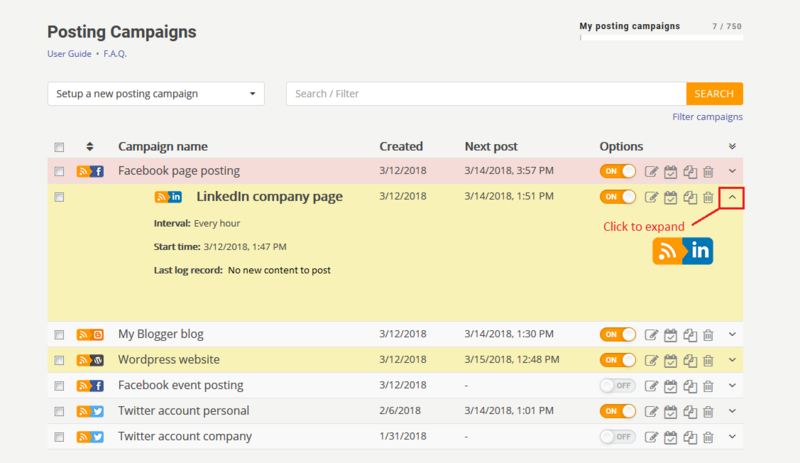 You can delete your posting campaigns in bulk. 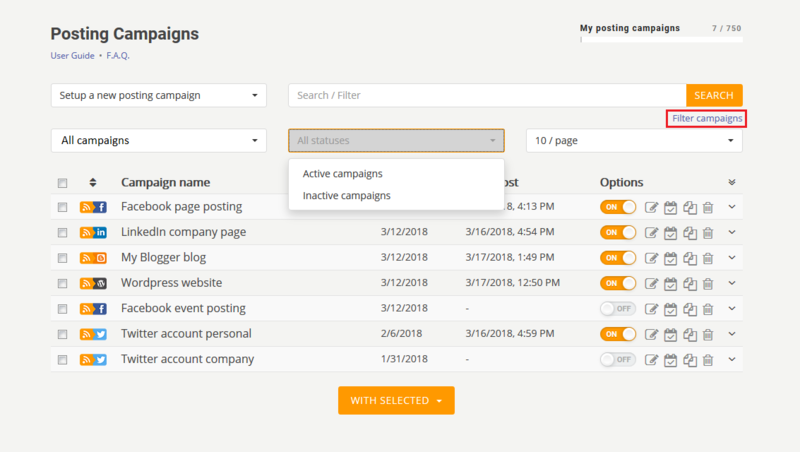 Select needed campaigns and press WITH SELECTED button. Then choose Delete option. 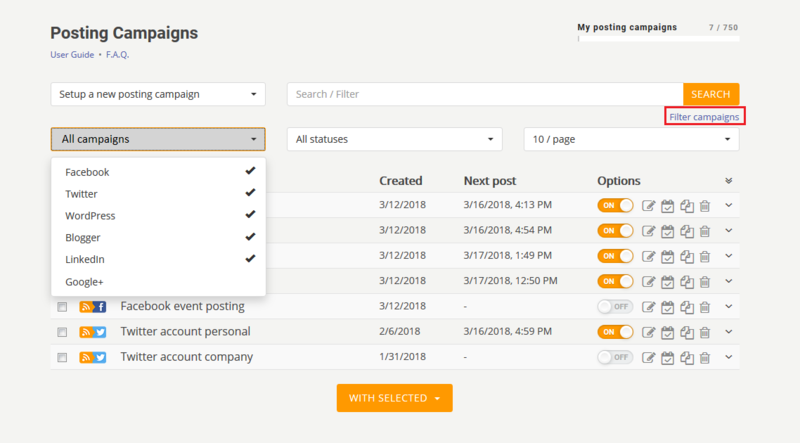 The same way you can activate and deactivate your posting campaigns in bulk. When you are done with existing posting campaigns use Set up a new posting campaign option to create a new one. Just choose your posting destination to go to campaign's editor. Or use Copy icon as described above. But remember about the limit on a number of posting campaigns for your membership level. Pay attention to a special indicator above the list of campaigns. It will show you how many posting campaigns you already have, and how close you are to your limit. If you are close to your limit the indicator will be red. As soon as you hit the limit you will have to deactivate existing campaigns to create new ones or upgrade your membership to a higher level. If at some point you will need to come back to this guide, please use the link below the title of this section, as well the link to frequently asked questions. 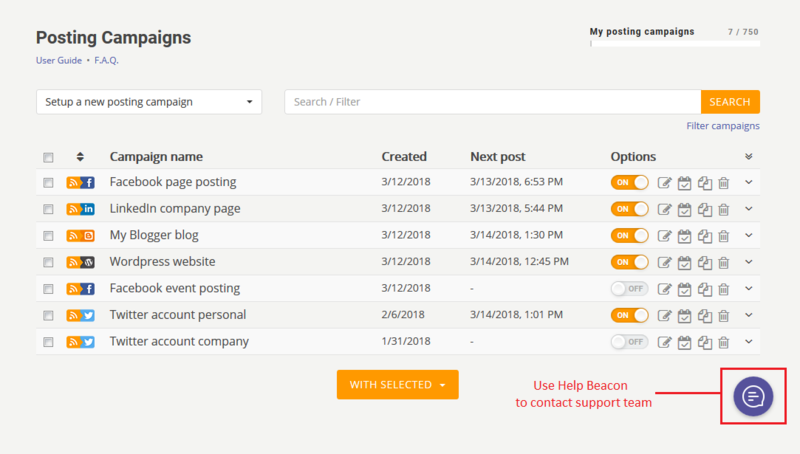 If you still have any questions or need any assistance don't hesitate to contact our support team using help beacon. We are always glad to help you with any issue. Now, this is really it! Enjoy!